The Trump Administration has proposed opening over 90% of our nation’s coast, including the Santa Barbara Channel, to new oil and gas drilling. This would be the first-time new oil leases are issued in California since 1984, when Ronald Reagan was president. We need your voice to make sure this dangerous and unacceptable plan does not move forward. Please submit your comments urging the Administration to protect our coastline, climate, and community health. Before March 9th, please visit this webpage: https://www.regulations.gov/document?D=BOEM-2017-0074-0001 and click on Comment Now! Include links to data that support your comments. Following are some additional talking points for you to consider using. I urge you to remove the Santa Barbara Channel and the rest of the waters offshore California, Oregon, and Washington from consideration of any new offshore oil and gas leasing. The Santa Barbara Channel contains one of the top five most biodiverse and rich marine ecosystems in the world and is home to the Channel Islands National Marine Sanctuary and Park, federal and state Marine Protected Areas, and is often referred to as the Galapagos of North America. This area is also an important migratory route and feeding area for endangered blue, humpback, and fin whales, all of which would be put at risk by new offshore oil drilling due to noise impacts, future spills, and ship strikes. The catastrophic 1969 Santa Barbara Oil Spill, and the more recent 2015 Refugio Oil Spill, are examples that there is no way to drill for new oil without causing devastating impacts to our coastal environment, tourism and recreation, and economy. Annually, over 150 million visitors come to California, which has the largest ocean economy in the United States. Tourism and recreation is the largest sector of the state’s ocean economy, which provides 75% of ocean economy jobs and contributes $17.6 billion toward the state’s GDP. As we have come to experience and understand the risks of climate change, we insist on moving away from the risky, polluting energy sources of the past and toward cleaner, safer, renewable energy. The people of the central coast and California have made it very clear that it is time to focus on cleaner and safer renewable energy sources. The Cities of Santa Barbara and Goleta have committed to moving away from oil and gas and have passed resolutions to be 100% fossil free by 2030. There is bipartisan opposition to new offshore oil drilling from Sacramento and from critical agencies including the California Coastal Commission and the State Lands Commission. 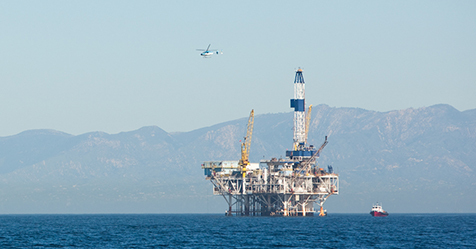 Ventura and Santa Barbara Counties, and many of the cities within the two counties, are among over 30 municipalities in California to pass resolutions in opposition to new offshore oil drilling.